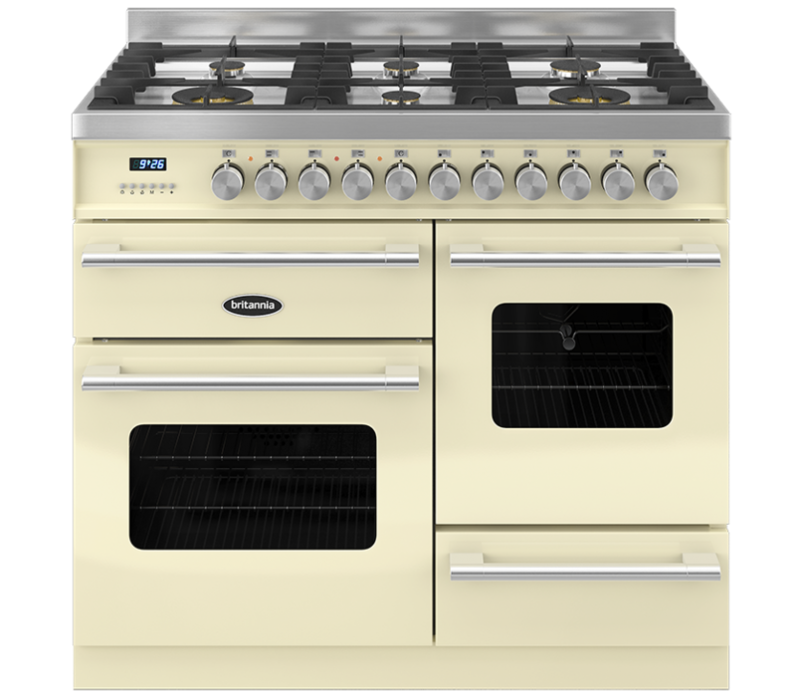 The Britannia Delphi 100cm XG RC10XGGDECR Dual Fuel Range Cooker delivers energy-efficient yet versatile cookery with its two ovens, three grills and a large gas hob. The main oven offers 52 litres of space and 9 different functions that allow you to combine different types of heating for diverse results. In the second oven, there is a further 42 litres of space and four oven functions that combine fan and conventional heating to give you even more versatility. A rotisserie in this oven allows you to enjoy tender, juicy chicken and turkey in less time than roasting would take. There's also a 24-litre dedicated grilling compartment that allows you to grill even more food at once, so you can use the cooker's full complement of options at once for true versatility. Fanned grilling allows you to cook faster and achieve more even results. The high-quality shelves are fitted with telescopic runners in the main oven for smooth, easy extraction and insertion, and to prevent accidental over extension and tipping. Catalytic liners oxidise fat spits and food spillages in the oven so that you can quickly and easily wipe away the mess. Use the programmable meat probe to test when your roast is cooked to perfection, and keep essential pots, pans and other cookware in the handy storage drawer, which features a soft-close mechanism for a more peaceful kitchen.